Charity Challenge was founded to bring the Central Florida together by providing an opportunity to get involved in the community, have fun and give back to charity. Come out and join us on Saturday, May 18, 2019 at Camping World Stadium and be part of the excitement that is Charity Challenge! For the past 33 years, together we have had remarkable results; evolving from a four-team backyard event into a multi-media extravaganza raising more than 6.4 million for local charities. 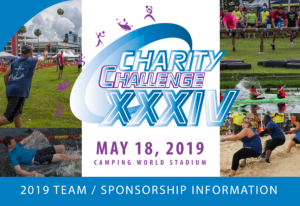 Come out and join us on Saturday, May 18, 2019, at Camping World Stadium and be part of the excitement that is Charity Challenge! Thank you to all our 2018 sponsors, teams, vendors, and volunteers for making Charity Challenge XXXIV a success! Since 1987, we have raised over $6.4 million for charities in Central FL impacting countless lives. Join us for our Annual Charity Luncheon with check presentations on Wed, August 25, 2018 at Eastmonte Civic Center from 11:30 AM – 1:00 PM. Face the Challenge, Give to Charity! Join us on Saturday, May 18, 2019, at the Camping World Stadium for our biggest event to date as we celebrate our 31st year! Here at Charity Challenge we have combined friendly, challenging competition with charity. A pretty novel idea, wouldn’t you agree? Last year we raised over $203,000 for 61 charities. This year, let’s make it even bigger! Here’s a useful list of “To-do’s” while getting prepared for Charity Challenge this year! Pay Team Registration/Donation of $500 per team. Invite other restaurants, clubs, hotels, theme parks and apartment complexes to compete against us! Send recommended 4- $25 gift certificates ($100 total), for volunteers, to Charity Challenge office. Begin stretching regime- very important! Assign people to each event; 3 males & 3 females per event, except tug-of war, 2 females and 4 males. CHECK OUT OUR 2019 BROCHURE! Get Your Official Team Shirts! TOO GOOD TO MISS! SIGN UP NOW! ONLY A FEW WEEKS AWAY!